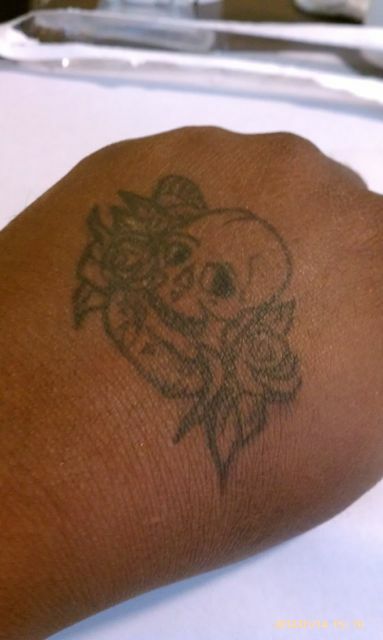 Here is a temp tattoo I did on myself using a tattoo ink pen. The angle was a little difficult but I think it worked out pretty well. As a makeup artist, sometimes you have to cover tattoos on a actor and sometimes you have to add them. 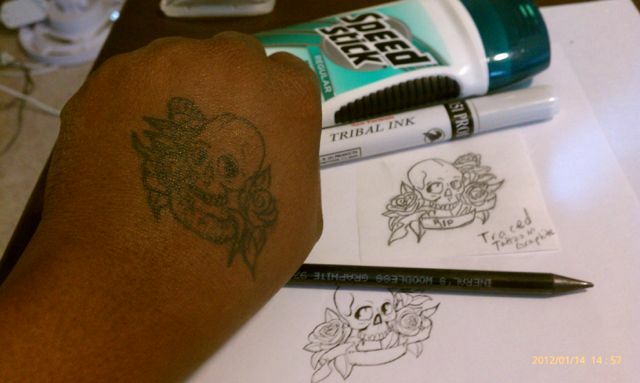 If you need to add a faux tat, here are the steps to create a tattoo transfer rather than drawing it freehand. Print out a design that you like as a mirror image. Place a piece of tracing paper over the design. Using a sharped graphite pencil, carefully trace the design. Prep the application area by cleaning the skin with alcohol. Let the skin dry before proceeding. Apply the Speed Stick to the application area. Don’t over do it. Place the transfer face-down onto the skin, press firmly, then smooth from the center to the outer edges. Remove the transfer. You should have an adequate outline to color over. Go over the transfer outline on your model’s skin with the alcohol based paint of your choice. Dust heavily with colorless powder and let it set for a few seconds before brushing the powder off. Be sure to print the image of your tattoo in reverse. Most programs will give you the option to print as a mirror image. This is especially important if you are transferring something with letters in it. Tomorrow is Sunday, which I have decided to take off as my weekly day of rest, but on Monday I will list tips to help your temporary tattoo last longer. In school I learned how to do this procedure with Dettol, but another MUA, Rosa Menendez, suggested Speed Stick. It works just as well and is easier to find. Thanks Rosa! Please feel free to leave comments and let me know what you think. I would love to hear from you. ← Can a 10 minute zombie makeup look be good enough for film?